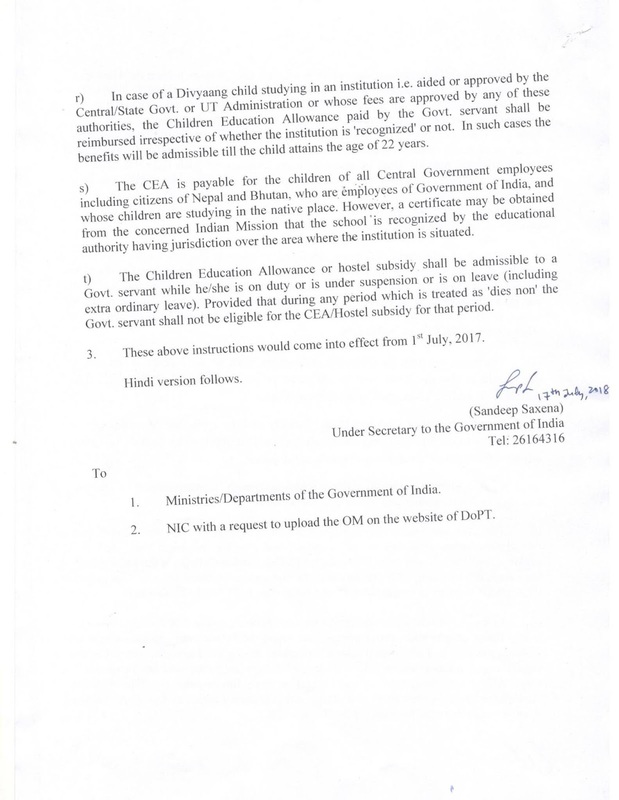 NUGDS Memorandum to all Members of Parliament : Request for intervene by Member’s of Parliament ( Lok Sabha & Rajya Sabha ) in achieving Civil Servant Status to Gramin Dak Sevaks in Postal Department. 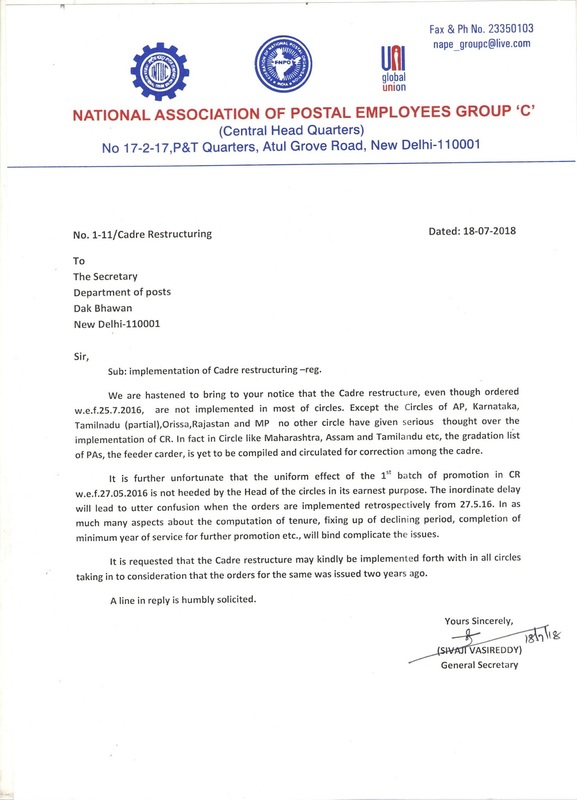 (FEDARATION OF NATIONAL POSTAL ORGANISATIONS) 17-2-17 , P&T Quarters , Atul Grove Road ,New Delhi -110001. 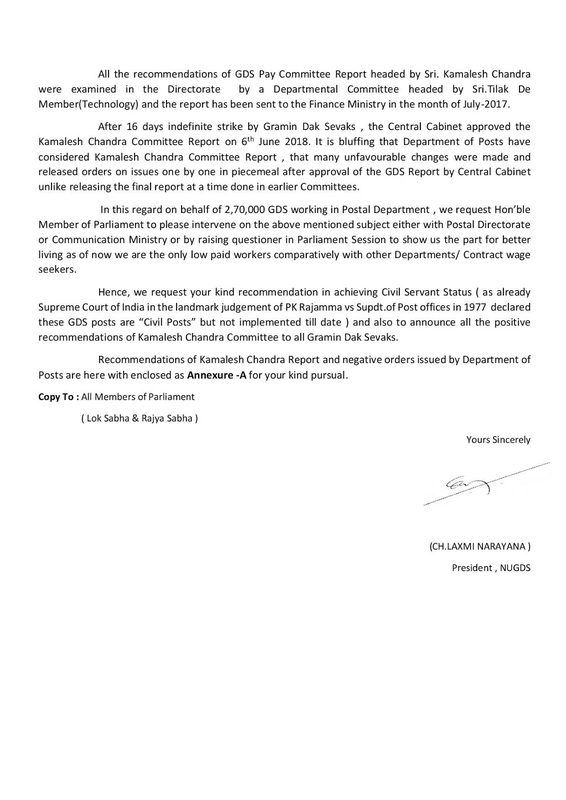 Sub : Request for intervene by Member’s of Parliament ( Lok Sabha & Rajya Sabha ) in achieving Civil Servant Status to Gramin Dak Sevaks in Postal Department. 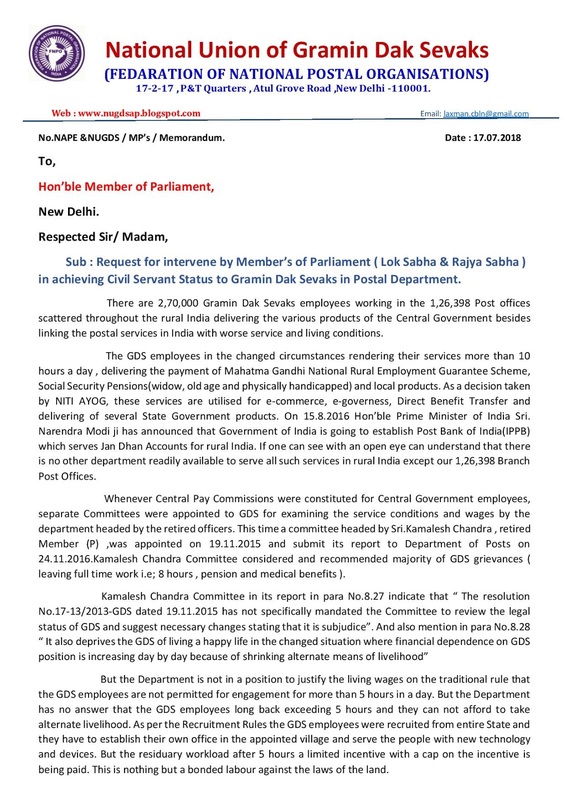 There are 2,70,000 Gramin Dak Sevaks employees working in the 1,26,398 Post offices scattered throughout the rural India delivering the various products of the Central Government besides linking the postal services in India with worse service and living conditions. The GDS employees in the changed circumstances rendering their services more than 10 hours a day , delivering the payment of Mahatma Gandhi National Rural Employment Guarantee Scheme, Social Security Pensions(widow, old age and physically handicapped) and local products. As a decision taken by NITI AYOG, these services are utilised for e-commerce, e-governess, Direct Benefit Transfer and delivering of several State Government products. On 15.8.2016 Hon’ble Prime Minister of India Sri. Narendra Modi ji has announced that Government of India is going to establish Post Bank of India(IPPB) which serves Jan Dhan Accounts for rural India. If one can see with an open eye can understand that there is no other department readily available to serve all such services in rural India except our 1,26,398 Branch Post Offices. 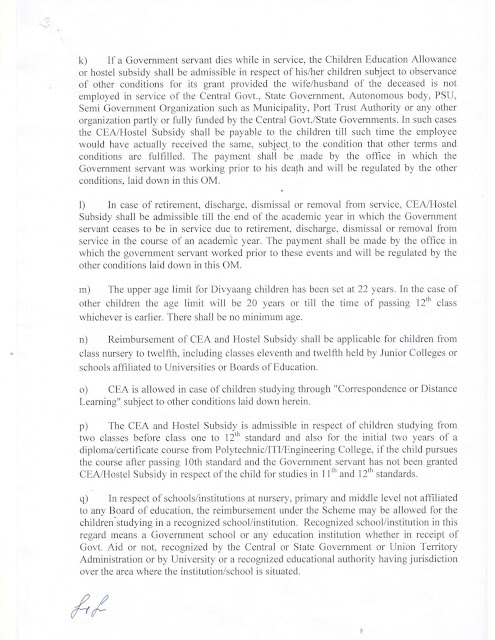 Whenever Central Pay Commissions were constituted for Central Government employees, separate Committees were appointed to GDS for examining the service conditions and wages by the department headed by the retired officers. 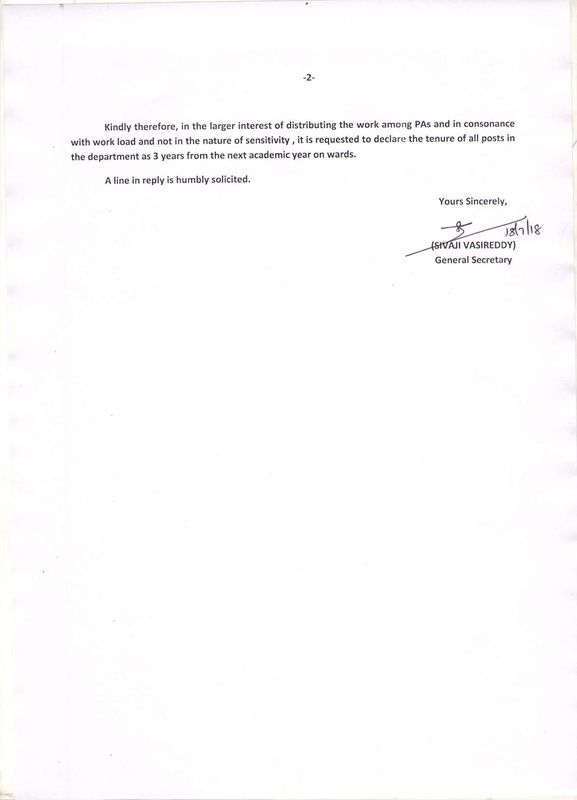 This time a committee headed by Sri.Kamalesh Chandra , retired Member (P) ,was appointed on 19.11.2015 and submit its report to Department of Posts on 24.11.2016.Kamalesh Chandra Committee considered and recommended majority of GDS grievances ( leaving full time work i.e; 8 hours , pension and medical benefits ). 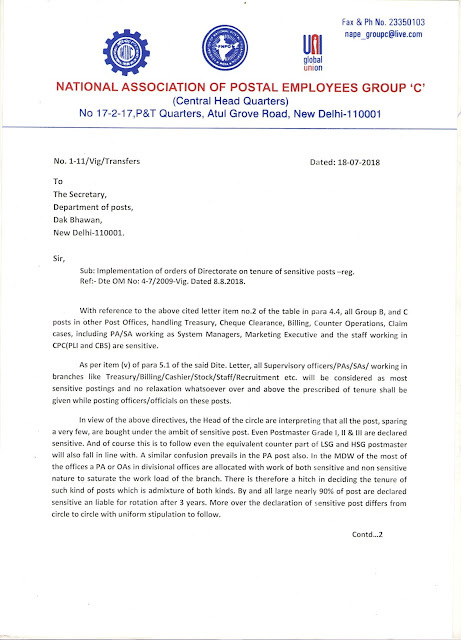 But the Department is not in a position to justify the living wages on the traditional rule that the GDS employees are not permitted for engagement for more than 5 hours in a day. 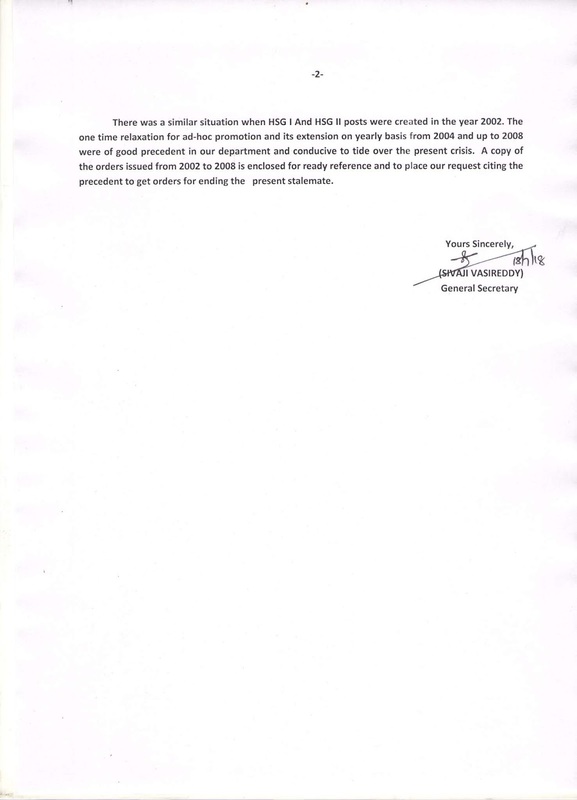 But the Department has no answer that the GDS employees long back exceeding 5 hours and they can not afford to take alternate livelihood. As per the Recruitment Rules the GDS employees were recruited from entire State and they have to establish their own office in the appointed village and serve the people with new technology and devices. 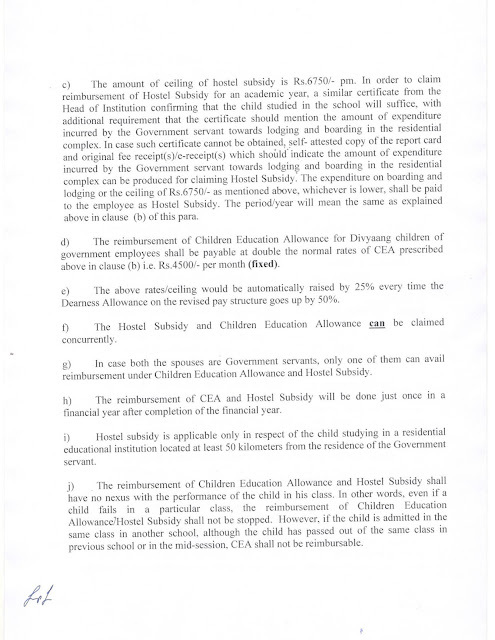 But the residuary workload after 5 hours a limited incentive with a cap on the incentive is being paid. 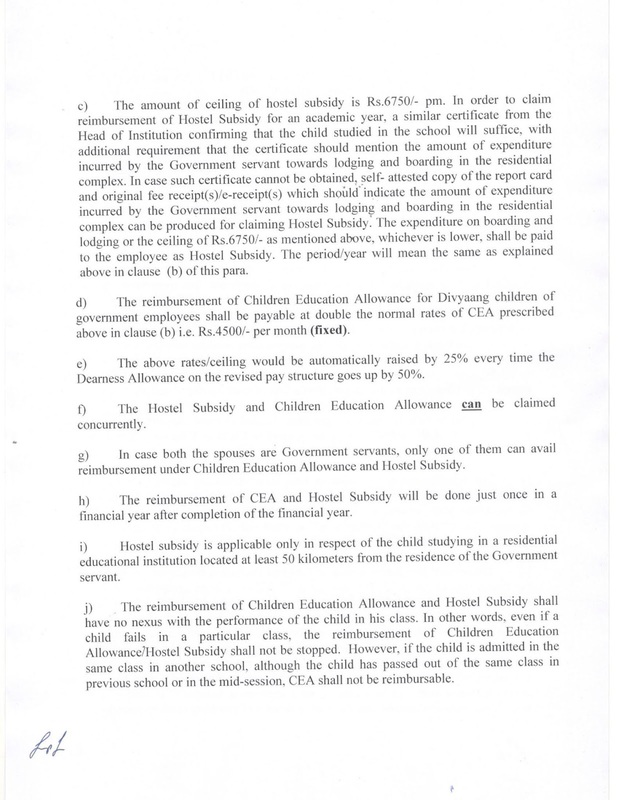 This is nothing but a bonded labour against the laws of the land. 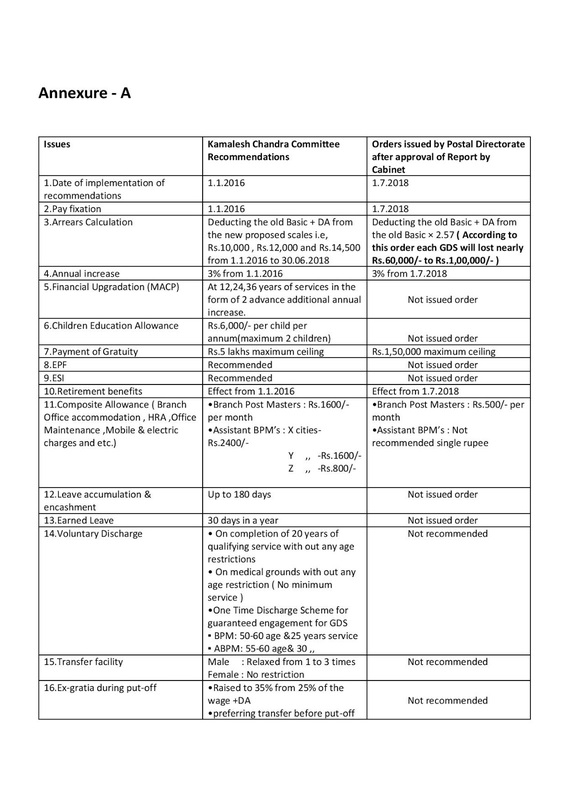 All the recommendations of GDS Pay Committee Report headed by Sri. Kamalesh Chandra were examined in the Directorate by a Departmental Committee headed by Sri.Tilak De Member(Technology) and the report has been sent to the Finance Ministry in the month of July-2017. After 16 days indefinite strike by Gramin Dak Sevaks , the Central Cabinet approved the Kamalesh Chandra Committee Report on 6th June 2018. It is bluffing that Department of Posts have considered Kamalesh Chandra Committee Report , that many unfavourable changes were made and released orders on issues one by one in piecemeal after approval of the GDS Report by Central Cabinet unlike releasing the final report at a time done in earlier Committees. 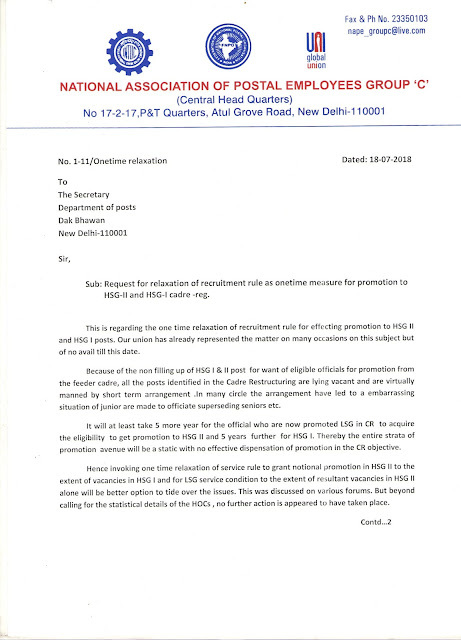 In this regard on behalf of 2,70,000 GDS working in Postal Department , we request Hon’ble Member of Parliament to please intervene on the above mentioned subject either with Postal Directorate or Communication Ministry or by raising questioner in Parliament Session to show us the part for better living as of now we are the only low paid workers comparatively with other Departments/ Contract wage seekers. 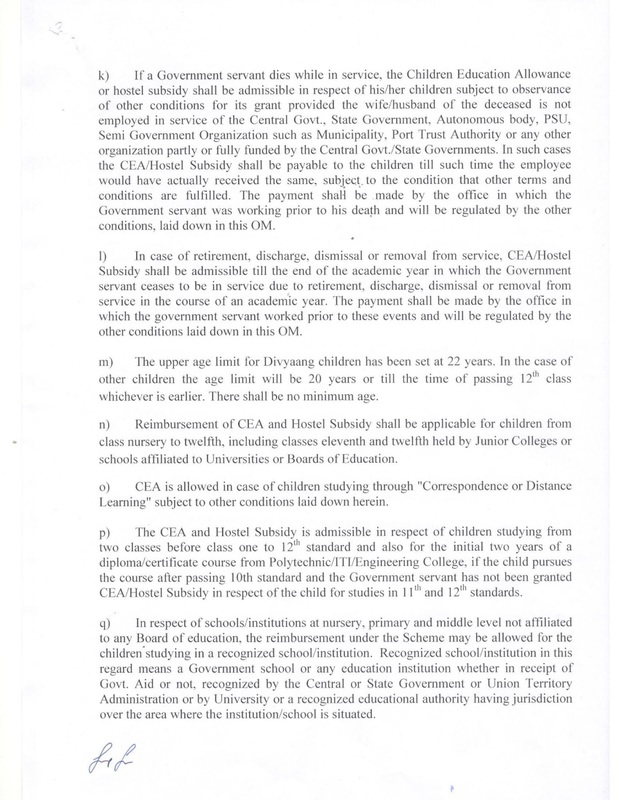 Hence, we request your kind recommendation in achieving Civil Servant Status ( as already Supreme Court of India in the landmark judgement of PK Rajamma vs Supdt.of Post offices in 1977 declared these GDS posts are “Civil Posts” but not implemented till date ) and also to announce all the positive recommendations of Kamalesh Chandra Committee to all Gramin Dak Sevaks. 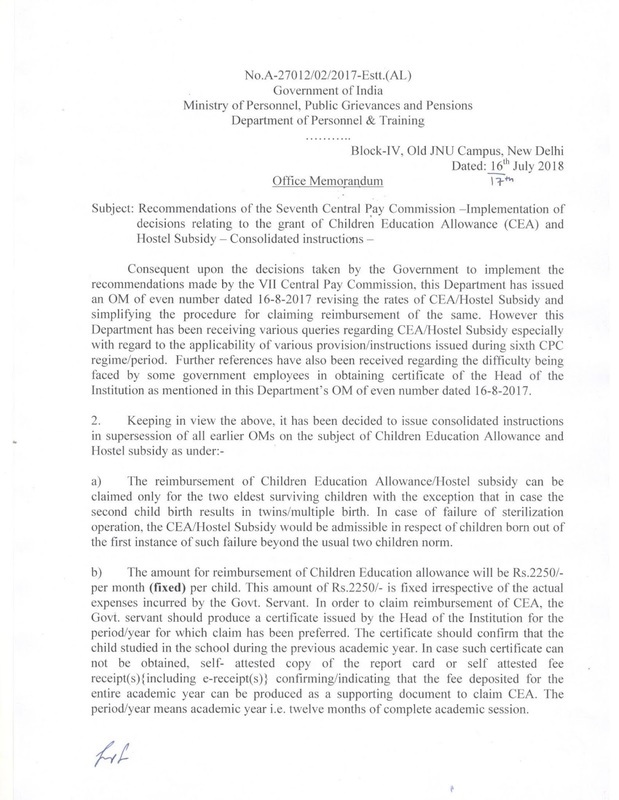 Recommendations of Kamalesh Chandra Report and negative orders issued by Department of Posts are here with enclosed as Annexure -A for your kind pursual. 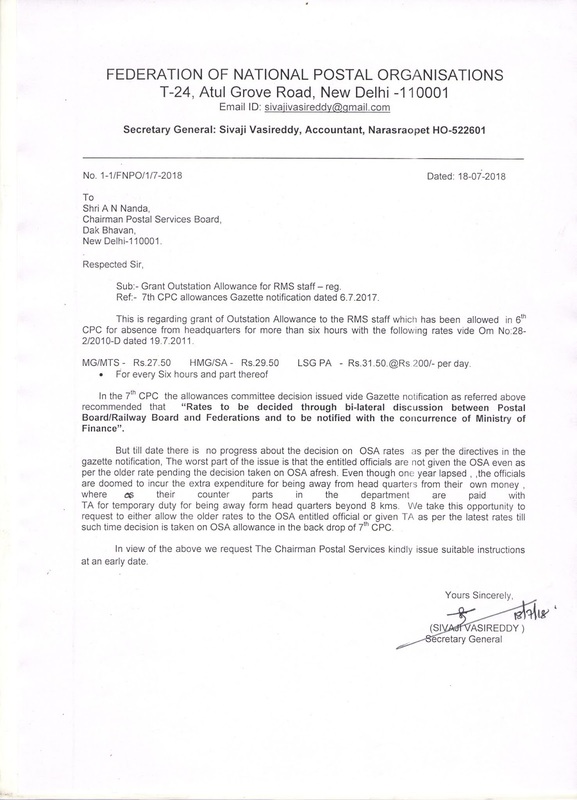 Implementation of orders of Directorate on tenure of sensitive posts - Reg : NAPE Gr-C GS letter to Secretary,DoP. 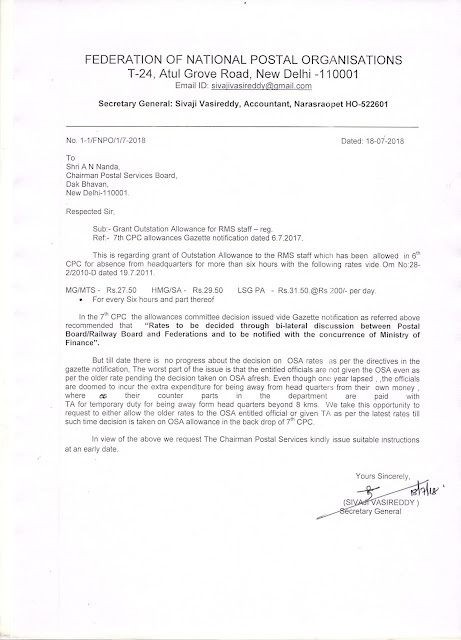 Grant of Outstation Allowance for RMS staff : SG FNPO letter to Secretary,DoP. Request for relaxation of Recruitment Rule as one time measure for promotion to HSG-II & HSG-I Cadre - Reg : NAPE Gr-C GS letter to Secretary , DoP.